“Ayon Audio offers a complete line of high performance audio components. Ayon components combine premium design, new construction principles, advanced technologies and profound musicality. Ayon components offer explosive dynamics, purity of tone, neutrality, finesse, emotional realism and stable sound stage projection. Our engineers are established leaders in their respective fields of high-end audio expertise. Our range of activities covers the development of high performance vacuum triode power tubes, the design of sonically outstanding tube preamps, triode tube power amplifiers, CD-Players with vacuum tube output stage and advanced technology speaker systems. Ayon components are designed with future upgrades in mind, providing for emerging new technologies, up-to-date performance and preservation of investment. Naturally flowing curves and sophisticated color schemes characterize the aesthetics of the Ayon line, offering a timeless value of understated elegance. This message brought to you by Ayon Music. Now for a message from the writer! Some of Ayon’s design criteria are ambitious to be sure. The good news is, in a nutshell, they pretty well deliver. Let me start by saying that the build quality of the CD-2, Polaris II preamplifier system and Typhon monoblock amplifiers was some of the finest I have seen. They are stout to be sure and having a friend or two to help you schlep them in is a good thing. Charlie Harrison, the distributor for the brand in the US, delivered the system to my home and we wrestled the five boxes into the house. We then got my studded 24-year-old-son Matt to help us unpack and set up. The old guys (well, me at least) were grateful to have the strong back of a young athlete helping out. The components all share the same cabinet materials, which are all very solid with extremely well machined billet aluminum front, back and side plates. They are anodized in black finish and all the front and rear panel descriptions, names etc. are not merely painted on but, machined into the aluminum. All knobs are very solid in feel and work very smoothly. There is a real quirk regarding the Ayon components and that is that all the ON/OFF switches are on the bottom of the component, roughly an eighth of an inch back from the front edge of the component. If you do not read the nicely done manuals that come with the components, I could see how someone who might think they know so much and who did not read the manuals first would find themselves frustrated in short order. And really, what manly man would ever cop to reading instructions? I mean really…come on! The end result of all the work on the cabinets is that these components are simply as enjoyable to look at as they are to listen to. A short note about the CD-2 is needed here. This review was for the amps and pre-amp but Charlie Harrison was kind enough to loan me the CD player for my personal audition. Our own Doug Schroeder auditioned the CD-2 a while back and you can read his review here. ”Do you want a hot, top loading, single chassis disc player which will give you close to the ultimate in digital performance, but you don’t want to spend $20,000? Then ogle the Ayon CD-2! I’ve been living with the CD-2 for about three months now, and it’s a Super Spinner. It does not do SACD, but what it can do for Redbook is so superb that you’ll get the notion you might just as well be hearing SACD. I can only confirm Doug’s sentiments regarding the CD-2. It is probably the best CD player I have ever had in my system to date. The Polaris is a two-chassis tube preamp design. One piece is the power supply and the other is the preamp. The components are of the exact same size, and while they are a bit on the large side, I was able to fit them into a four-shelf rack rather easily. Dimensions are 21x18x5 inches for each unit and they weigh in at 72.6 lbs for the pair. The Polaris II is a pure class A triode – pentode design. The unit employs negative feedback and utilizes a purist tube design with short signal paths and no transistors. All line input impedance is > 1MOhm. Ayon states that they use the highest quality passive components for all the applications in the pre-amp. The unit uses a VTC- “volume transformer control” with 2 channels and 24 positions on the stepped attenuator. The VTC has gold plated contacts and a channel balance within +/- 0.05 dB. Swiss Elma brand input selectors are used exclusively. Tube Complement Line stage is 2 Siemens C3M tubes, and for the 2 moving-coil phono stages there are 4 additional Siemens C3M tubes. The external power supply is tube regulated and rectified. It has a large toroidal power transformer encased in its own custom made, damped and RFI/EMI shielded sub-enclosure. It utilizes quad rectification with a choke power supply and AC phase polarity control indicator. The power supply has a muted warm up period to extend the life of the power supply itself and the pre-amp, as they are joined by a removable umbilical cord. To sum all that up the Polaris is extremely quiet for a tube pre-amp and quiet for any pre-amp for that matter. 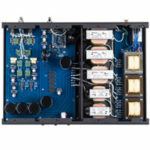 Some believe that the preamp is the single most important component in the system. The Polaris II goes a long way towards supporting that view point. 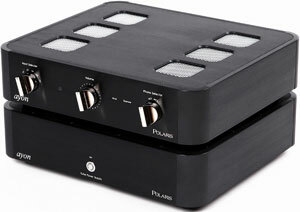 One of the stellar features of the Polaris II is the dual MC phono stages. I was not able to get the exact loading info for each but in mating both the Koetsu Tiger Eye Platinum and Urushi Vermillion, along with the Goldnote Tuscany, I ran into no problems whatsoever. All three of these cartridges are of notoriously low output at .2Mv for the Koetsus and .15 for the Tuscany. The Ayon phono stages handled them extremely well and I would place a bet that they are loaded at around 65-70dB and 100Ohms. The Polaris delivers music with weight and substance, balanced with delicacy in the fine details. I was not expecting a delivery of warmth, weight and detail with no smear. When I inserted the Polaris into my reference system I got the same sense of listening to live music in my own listening room. With the Polaris pre-amp, it is as if there are real people in the room. You feel the immediacy and the air around each instrument individually. Vocals were velvet floating on liquid, whatever that may actually mean. It just conjures up an image in my gray cells that seems right. Forgive my indulgence in the 60s and 70s. The damage is apparent. The Polaris delivers gobs and gobs of information with clarity and detail that rarely comes with an all-tube systems. This is not a digitized type of sound. Not razor sharpness or analytical to the hilt but rather it brings you into the music more so than it delivers music out to you and brings you right in with the performance. Attack and decay are more immediate as if you are sitting with the musicians. This is something I know a bit about. When playing with a band, at a reasonable volume, the leading edge of the attack of guitar strings is rather sharp and can be subtly manipulated creating very fine nuance changes. Easier to hear when you are right on top of it, a bit harder when removed from the instruments. With the Polaris I was hearing all those minute changes. Harmonic picking presented not only the octave overtone but the faint sound and feel of the combination of both flesh and pick-striking the string simultaneously. That is pretty detailed in my book. If I had anything to complain about, and what reviewer does not, it would be the operation of the remote. First it is a bit busy, and secondly when altering the volume the stepping noise is rather noticeable and sometimes seems to make it difficult for the volume control to move. 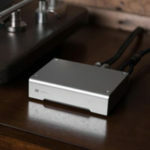 You must also bypass the remote to effectively switch to phono stages, but it is well worth the trip from chair of endless laziness to the pre-amp and back! Other than this one aspect, the overall experience was simply superb. Ayon Typhon – A tsunami of sound! Ok – it is Tie-Fon and not Tie-phooon – but the description just seemed to fit. Anyone who has had any experience with 6C33 power output tubes seem to swear by them as being robust and providing some of the sonic magic of a 300B with the grunt and push of a KT88 or 211. 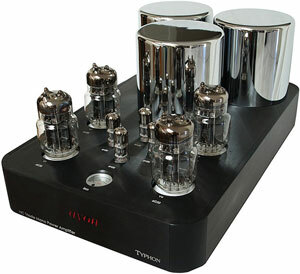 The Typhons use four 6C33 output tubes and four 6H30 pre-driver tubes of Russian origins. Say what you will about the Soviet Union, but those people know how to make tubes. The 6C33 in specific was originally designed for the Russian military and is used extensively in MIG aircraft as a low voltage series pass regulator. It is a dual power triode design. The tube utilizes two separate filaments, and may be operated with one or both simultaneously. One filament operation reduces plate dissipation to 75% of maximum rating. These are very rugged tubes designed to withstand 10Gs of force in fighter aircraft applications. They are said to have roughly a 1000 hour life in that usage. Since very few amplifiers in home audio use ever sustain loads of 10Gs, I think it is safe to say they should last a bit longer in audio use. Once you get the amps out of the double boxes you will find that each is encased in a velvet bag. Nice touch! Then when you get them out of the velvet bag you find that each transformer is encased in its own velvet bag. Keeps the chrome nice and shiny. (And shiny it is). Once again you cannot help but be struck by the incredible build quality of these components. I have seen and listened to numerous products that cost three to four times as much whose build quality is suspect at best. At least with Ayon you know you are getting a well built unit that someone took a great deal of pride in making. Once you get them set up it is time to place the tubes and do the biasing. Ayon goes so far as to not only match tube sets but also specify which socket each tube goes into. Once the tubes are seated you need to find the ON/OFF switch and fire them up. Once they have had a bit of warm-up time via the pre-warming feature, it is time to do the biasing. Here is the first grip of sorts with this particular component. The bias switches are all at the back and there are four different pots, one for each tube, and they require a very small slotted screwdriver to turn. The meter is at the front of the unit so it requires that you fiddle around at the back and then look at the front to set each tube’s bias. Good news is that once they are dialed in they stay very stable. I only had to make one adjustment when a tube went out and I had to replace it. The other niggling little thing is that the labeling on the back of the amps is underneath every input and speaker connector. While this sounds a bit trivial, it is anything but when you consider that these amps will most likely be placed on or near the floor on amp stands. This makes getting back and reading the labels next to impossible once you get them set. For someone who has had numerous back surgeries and a neck rebuild this is a bit inconvenient. Would it be so hard to label them from the top? I have to believe I am not the only person who would appreciate it. Ok that is it for the gripes. 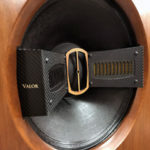 I connected all the Ayon components with the XLO Signature 3 Reference cabling and they mated very well indeed. After I was sure everything was settling in well, I began to really take a listen to these amps. People often note that tubes can have a real laid back upper frequency delivery. The Typhon is certainly not guilty of that. The Typhon has all the sparkle, detail and shimmer of any solid-state amplifier I have ever listened to. Come to think of it, I am not sure I have heard this much detail in any other tube amp or many solid-state units. Perhaps it is the mating of the 6C33 and the 6H30 pre-drivers that allows it to deliver such incredible highs. In addition to some outstanding upper end both the midrange and the bass were stellar. The midrange was especially silky when mated to the Polaris pre-amp. Everything I have stated earlier about the sound of the Polaris goes for the sound of the Typhon, and the synergy these pieces have is truly inspiring. 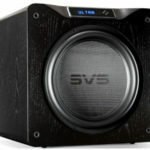 The slam that it delivers and the rhythm and pace are on par with some of the best solid-state units I have heard. The Pass 350 comes to mind. (I actually really like those Pass amps but don’t tell anyone because I am a dyed-in-the-wool tube aficionado). The rest of the spectrum just comes across with such immediacy and life. This system literally breaths air into the room and lifts notes up and allows the music to ride on this sonic magic carpet. Whew that was flowery wasn’t it? The thing is: That is the most accurate way to describe the sound. One thing that surprised me was that the Typhon’s 6C33s delivered as much punch as 211s. I had not spent this much time with any amplifier employing the 6C33s. I now understand why so many people like them. They really do seem to blend traits of the mid range sweetness of 300Bs to the grunt of more powerful tubes like the 211s. Lately I have been listening to more obscure recordings from folks like Ginger Baker and Miri Ben-Ari. For those not in the know Ginger Baker is a drummer whose big breakthrough came as the drummer for Cream. If you don’t know that group I simply need to go no further anyway. He has been considered one of the better drummers of the rock and roll world for years. At the Cream reunion he showed he could still play exceptionally well for a man of 70 years of age. On Ginger’s Middle Passage album (Axiom 539 864-1) the track “Mektoub” contains a great deal of interesting syncopation and various percussion instruments in the rhythm track. The Typhons deliver it with enough finesse that the standard drum kit does not completely overshadow some of the traditional African drums used on the track; but rather presents them in a 3D context and separates them out in both stage width and depth placement. Miri Ben-Ari is known as the “Hip Hop Violinist”. The Israeli-born violinist marries a number of different styles in her music, always providing a very interesting sound. On her Sahara album (2000 Half Note recordings) the track “Like a Rose” has her violin voiced through a couple of digital effects such as chorus and delay, and perhaps a bit of help from a overdrive box. How do I know this? Easy! I play through those types of effects myself and the Polaris/Typhon combo brought enough detail out in the recording that I could spot them. That does not happen every day. One thing is for sure, when it came time to pack them up I was very, very unhappy and not because of the manual labor it took! I would welcome them all back into my home again, anytime. Who knows when the economy gets a bit better and I begin to get bored with what I have now I might just try to convince Paula………….